Release of histamine by mast cells is a biochemical manifestation associated with allergic enteropathy and other gut disorders (Piva et ai, 2002). Another key decarboxylase initiates the synthesis of polyamines, molecules that are essential in the regulation of cell growth and differentiation. The enzyme concerned is ornithine decarboxylase (ODC). 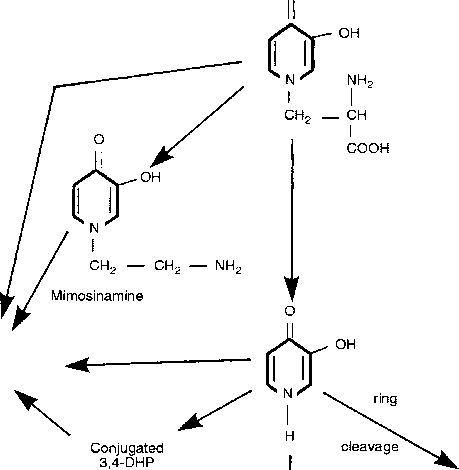 Hydroxylases play a key role in animal metabolism and no account of amino acid pathways would be complete without reference to phenylalanine hydroxylase, which catalyses the formation of tyrosine from phenylalanine. Animals can thus synthesize tyrosine for important reactions as long as sufficient quantities of phenylalanine are present in the diet. Tyrosine is a component of proteins, and provides the aromatic ring for the synthesis of thyroxine, adrenaline (epinephrine) and noradrenaline (norepinephrine).